Since Jefferson founded public education for the citizens of the United States, schools have been charged with the safety of children in their care – a duty to protect. Teachers and administrators have a responsibility to anticipate potential dangers and to take precautions to protect their students from those dangers. DOES YOUR K-12 DISTRICT HAVE A SCHOOL SECURITY PLAN? 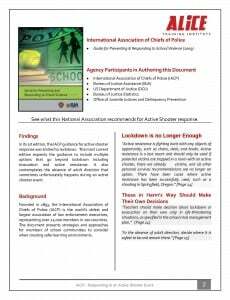 Find out if your K-12 School is prepared to respond to the threat of an active shooter. Take our FREE Active Shooter Vulnerability Self-Assessment. Whether you’re a small or large K-12 school – we’ve got you covered. 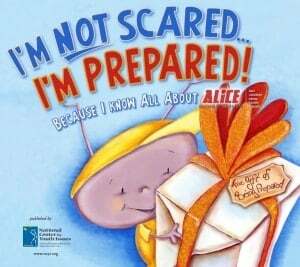 e-Learning for K-12 Schools supplemented with certified ALICE Instructor Training. Interactive training course for students, parents and teachers to receive an individual certificate. If your K-12 school’s only response is Lockdown . . . you’re at odds with the US Department of Education. 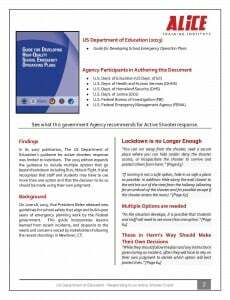 In its 2007 publication, the US Department of Education’s guidance for active shooter response was limited to lockdown-only approach that included students hiding under desk or against walls. Some of these techniques originated during the cold war as a method of protection from a nuclear threat. 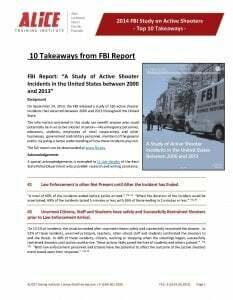 In 2013, the US Department of Education spent considerable resources researching active shooting events. Their findings have resulted in a change in guidance. ALICE Training protocols are used almost exclusively in all new guidance. Following current federal and state recommendations is a major step in limiting a school district’s liability by demonstrating they have met today’s standard of care. Certify your School. Show your Parents, your Community you care. A 2015 Gallup poll results show that three in 10 U.S. Parents worry about their children’s safety at school. The most horrifying acts of violence at U.S. schools can leave temporary impressions on parents’ psyches. The early 2000’s, which were just as much to post 9/11 years as they were the post-Columbine years, ranked high for parental anxiety about school security. Teach kids about school security without making them scared. You can teach children about school security without scaring them – You just need to know how. Young people are at risk of assault, abduction, and abuse even in caring families, schools, and communities. Skills and knowledge are the keys to keeping kids safe. The good news is that there are simple and effective ways of teaching children how to protect themselves that will work most of the time. 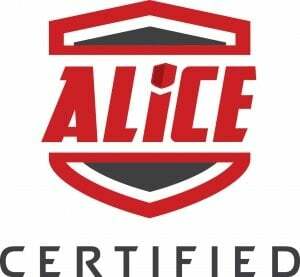 Why should your school be ALICE Training Certified? Not sure which ALICE Training solution is right for you?